Ai’ta! 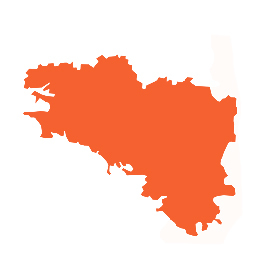 is a group whose primary objective is to defend and promote the Breton language, and ensure that it remains a living language in all areas of society. To achieve this it is vital that everybody be allowed to see, hear and speak Breton in public life… A language which cannot be used in day-to-day life is a language condemned to die. 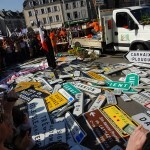 For this reason we demand that Breton, along with those who speak it, be respected everywhere in Brittany. To this end it is indispensable that our language be given official recognition. 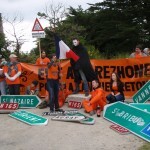 Whilst waiting for that inevitable step on the road to the re-appropriation of the Breton language by the Breton people, the group lacks no imagination and organises numerous actions to inform the largest number of people, and develop the space given to Breton in society. However, and this is vitally important, our actions are always guided by a sense of humour and playful spiritthat in noway stop us from respecting or helping public service users. Indeed, Ai‘ta ! 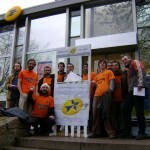 has chosen non-violent direct action as a means of expression to ensure that we are heard. Created by young Breton speakers, the group Ai’ta! 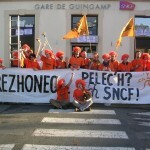 was joined by numerous citizens concerned for the future of the Breton language. 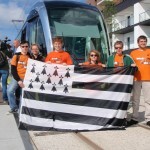 Young and not so young, we come from the 5 departments of Brittany, and we are organised into different local groups (Trégor, Léon, Pays Vannetais, Rennes…). 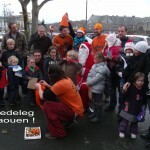 During our actions, we are recognisable by our orange T-shirts with “Brezhoneg bev! 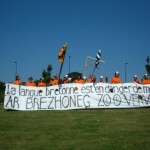 – Brezhoneg ofisiel!” (Breton, a living language! 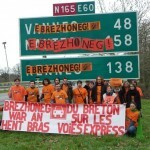 Breton, an official language!) written on them. The actions of our group are based upon a certain number of principles and all those who wish to participate in our dynamic must adhere to them. 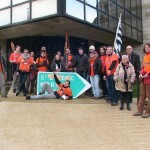 The group is open to all who want to defend and promote the Breton language whether Breton speaker or not. The Breton language is the preferred language of communication within Ai’ta!, but efforts are made to welcome everyone. Our group is decidedly non-violent and completely independent from any other organisation (political party, trade union, association, company…). Ai’ta! works on the bases of direct democracy: there is no president, leader or board of directors to take decisions! Everyone can take part at his/her level and decisions are taken collectively. The work of Ai’ta! is compatible with and inspired by the general respect of all languages and cultures. The values dear to Ai’ta! are incompatible with all forms of racist, xenophobic, sexist or homophobic behaviour. How to meet us, take part and support us. 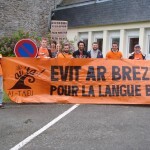 The group is open to all who wish to defend and promote the Breton language whether young or not so young, Breton speaking or not. The more that participate the greater the dynamic of Ai’ta! will become. 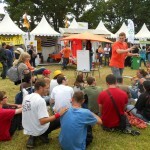 Come and meet us on different occasions, it is with pleasure that you will be welcomed at one of our stands, at one of our meetings or on the ground during one of our actions. It will be the opportunity to see for yourselves how our group is structured and to ask us all your questions. If you wish you could also buy T-shirts, cups, stickers “E brezhoneg!” (In Breton! 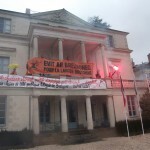 ), badges “Me ‘oar brezhoneg” (I know Breton) and other objects vital to promoting our struggle. Do not hesitate to contact us by e-mail (contact@ai-ta.bzh), whether to ask for information, buy something or any other reason. Because the struggle has a price, it is equally possible to help our group financially so that we may continue our work in favour of the Breton language and its development (financing of correspondence, flyers and T-shirts, the provision of materials for our actions…).